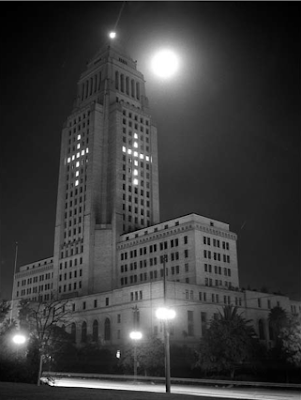 For over forty years during the Christmas season (as well as around Easter), the lights of City Hall in downtown Los Angeles were arranged to form a cross. The practice began in 1937, and continued until the late 1970's, when the threat of lawsuits ended it. 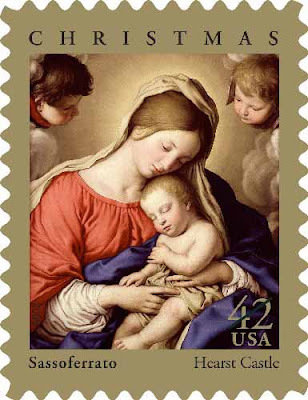 Unlike "secular Europe" where everyone still wishes each other a Merry Christmas, Americans seem to have become so, well, fearful of even the word "Christmas," choosing instead a bland "Happy Holidays" or - even worse - "Happy Holiday" (and what "holiday" would that be?). Thomas Jefferson's "separation of church and state" (mentioned no where in the the Constitution, but in a letter to a group of Baptist ministers) most certainly does not mean "the separation of religion from public life." As an aside, the U.S. 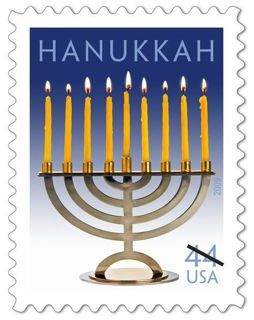 Postal Service issued their first "religious" Christmas stamp in 1965, the first Hanukkah stamp in 1996.